While perusing my local library’s children’s section, I found a wonderful collection of playful poems, insightful science and glorious artwork. 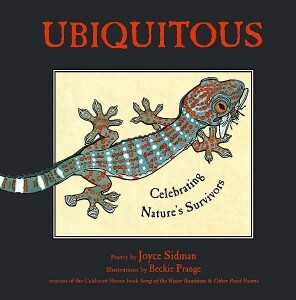 In Ubiquitous: Celebrating Nature’s Survivors, written by Joyce Sidman and illustrated by Beckie Prange, the reader is treated to an engrossing portfolio of fourteen success stories from the timeline of life. I was spellbound just opening the book to the endpapers. What greeted me was an impressionistic illustration of the history of life on Earth. Using 46 meters of cotton string and the brilliant colors of the rainbow, Prange recreates and elaborates upon the Long Black Line. Rather than stretching down a long hall, or across a field, this timeline bends and swirls to fit within a much smaller space. Interestingly, the effect is as profound, held in our very hands. With each page I was drawn deeper, continuously fascinated by the discoveries I was making – new knowledge about organisms, some of whom I thought I knew quite well. But that’s part of the magic, right? To allow for and celebrate the known becoming new and strange again. I greatly appreciated how Sidman and Prange chose, for some of their examples, species that are more often maligned than revered. How refreshing to see a positive and inquisitive voice brought to grasses, crows, dandelions and coyotes. In an age where the pursuit of ease and cleanliness seems to be paramount for many adults, to find in this book organisms often given a bad reputation for being irritating or troublesome was especially gratifying. As with contemporary compendiums on topics of nature and survival, this book too also brings to light some of the present dangers that threaten the species highlighted within. Sidman’s text, however, is well balanced – allowing for the notation of real threats without resorting lambasting humans outright – for nothing is quite that simple. I invite you to add Ubiquitous to your classroom collection. It will enchant readers of any age, and provide for the possibility of great discussions on our place and role in it all.